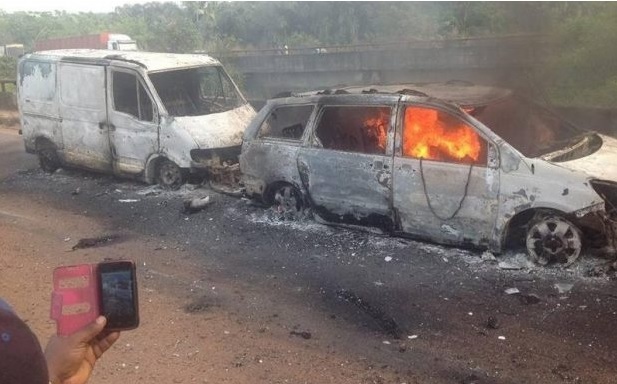 Prayers for the 53 people killed and 5 seriously injured in a crash on Thursday at Abudu. According to The Nation, the accident was caused due to a brake failure from the tanker which led to explosion involving 8 vehicles and a motorcycle. This road is deadly, one news of death to the other. On our way back from Anambra for a wedding sometime in 2010, the transport bus driving right in front of us literally swerved and off it went down a cliff, I could not believe my eyes and only about 4 months ago did a car accident kill around 4 people. The road is a busy road as it is the route to many eastern states. I wonder how much longer, how many people needs to die for the Government to start taking measures and investments to make the road safer. Benin, Worldwide Bookmark the permalink.